+ GF Agie Charmilles which has long been a recognized market leader in providing world-class service and support. To raise the bar and exceed expectations yet again, we have established Privilege Club. The first program in the industry of its kind, Privilege Club rewards customers with valuable exclusive benefits. For every dollar you invest in consumables and wear parts, you will earn one privilege point. All Agie Charmilles customers are immediately eligible to participate in the program through automatic enrollment. There is only one source for parts and consumables specifically designed to maximize the performance of your GF AgieCharmilles machines. Third party components can result in performance losses of up to 20%. To guarantee the levels of performance that will sustain your competitive advantage, rely on original parts and consumables, directly from the machine manufacturer. 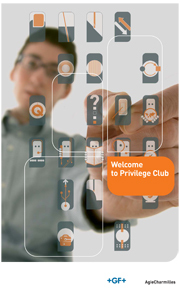 In addition to the pre-existing benefits of using original parts and consumables, all members of the Privilege Club now also receive Privilege Points in the unique Privilege Club program. These points can be redeemed for a wide variety of benefits, such as preventive maintenance, advanced operator training or machine utilization consultation. + Obtain the highest levels of accuracy from your machine by using the best possible components. + Maximize your machine’s life span by eliminating the wear and tear that can be introduced by third party parts and consumables. + Achieve a reliable production environment by knowing that every aspect of your machine is designed to work together. GF AgieCharmilles EDM and milling systems are designed to last. Their long service life demands that all component systems, whether mechanical, electronic, hydraulic, pneumatic or software, interact with the utmost precision, thus guaranteeing consistent high quality of the workpiece or tool machined. Don't be fooled by gray market knock-offs produced with low quality material having demonstrated poor operating life. Protect your investment by using GF AgieCharmilles original parts — it's the best way to achieve the highest possible output and longest operating duration. Currently, GF AgieCharmilles maintains a $3 million parts inventory. That means there is a 97+% chance your part will be in stock right now and shipped to you immediately. REMEMBER: AgieCharmilles STOCKS FILTERS and CONSUMABLE PARTS FOR IMMEDIATE DELIEVRY! SIGN UP for the Privlege Club and START SAVING TODAY!